I used always have cans of low-sodium, low-calorie soup on hand for quick dinners, and they became sort of a go-to. But once I started switching over to a Paleo diet, and checking my labels with a new perspective, I realized that they weren't exactly the best bet for a nutritious meal. I started making my own Paleo-friendly soups from scratch, but they became less of a go-to~ because they're just simply not as convenient as a can that's ready to heat & serve... and I didn't always have the time (or motivation) to "go there" for a weeknight dinner. 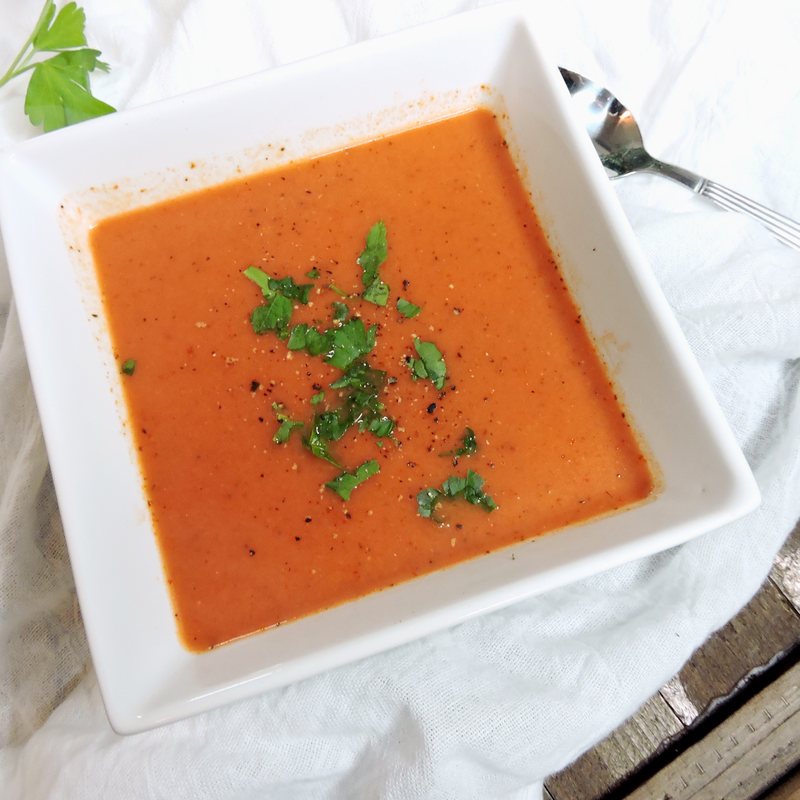 Enter my "Creamy Tomato Basil Soup": my way of bringing the convenience back to soup on a Paleo or Whole30 diet. I've made this many times now, when we're low on groceries and in a pinch, and I still can't get over how delicious & EASY it is. 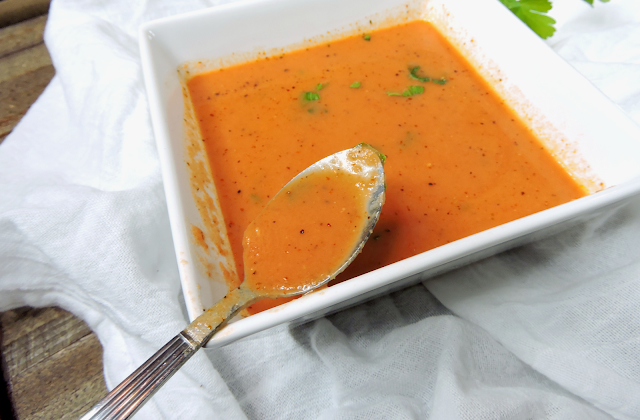 Diced tomatoes, spices, coconut milk, & broth combine in the blender then heat on the stove for a creamy, luscious soup that takes just minutes to prepare. It's really just as easy as a boxed or canned soup~ but so much cleaner! We loving pouring ours over meatballs (Aidell's Roasted Garlic & Sweet Basil Italian Meatballs are our fav) for the perfect 15-minute meal. I've put off posting this for quite some time, because it's so dang simple... but I'm excited to finally share! 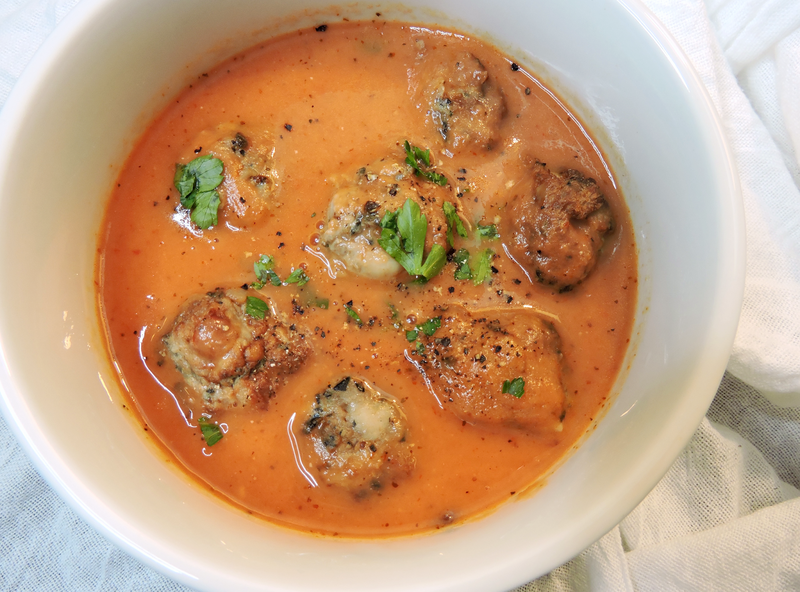 I hope you enjoy this quick, flavorful soup as much as I do. *Makes 20 oz (2.5 cups) of soup. In a blender or food processor, pulse the diced tomatoes and seasonings (Italian seasoning, dried onion, garlic powder, red pepper flakes) until smooth. Stir in the coconut milk and chicken broth, and season with salt & pepper to taste. Keep cooking until the soup is warmed through. Garnish with chopped fresh basil, and serve hot! I recommend chicken bone broth, but any other broth you like will work: beef, vegetable, etc. Red pepper flakes add a great touch of heat. You can leave them out completely, or add more to taste. The longer you allow the tomatoes to bubble, the more flavor you will get from them. I'm impatient & feel like 4-5 minutes is just long enough to get a good amount of flavor in a short amount of time. Let it go longer if you like~ just keep stirring! did I miss the basil? I forgot to list the basil garnish, but it's there now!! Did you use canned coconut milk or the ready-to-drink refridgerated kind? Canned! But you could use whatever you like! My kids, husband and I love this soup! It has been a staple each week for us! My son loved the meatball idea and so did my husband and I! My daughter sticks with a salad on the side( not much of a meat eater) so this is such an easy and delicious go to for our family!! Thank you!! Just made this today and sooooo good! And easy! !